Home » Lost civilisations » Chinese circumnavigation in 1421? In 2003, former submarine captain Gavin Menzies published a work that promised to rewrite the history of the ‘Age of Exploration’, 1421: the year China discovered the world. It’s an amusing commentary on American insularity that the edition published in the USA alters the subtitle to The year China discovered America: clearly the rest of the world doesn’t matter to Americans. He claims to have discovered evidence that a Chinese fleet set out in 1421 to explore and map the rest of the world. While Admiral Zheng He is known to have voyaged throughout the Indian Ocean, according to Menzies, groups of ships travelled the world, mapping the Americas, Antarctica, Greenland… but not Europe. We can but wonder why they failed to reach the one civilisation outside the Indian Ocean that would have recorded their visit. In the book, Menzies presented evidence that a Chinese admiral, Zhèng Hé (鄭和, 1371–1435, born Ma He, also Cheng Ho) had been sent by the Ming Emperor Yongle (永樂, 1360-1424, born Zhu Di, also Ch’eng Tsu or Yung Lo) on a voyage of discovery. That much is uncontroversial, as Zhèng Hé’s voyages around the Indian Ocean are well documented in contemporary records. Where Menzies departs from academic orthodoxy is in his claim that the fleet went on from the Indian Ocean to discover Australia in the east, Antarctica in the south, the Americas in the west and circumnavigate Greenland in the north. These are astonishing claims and must surely be backed up by good, contemporary evidence. Alas, no. 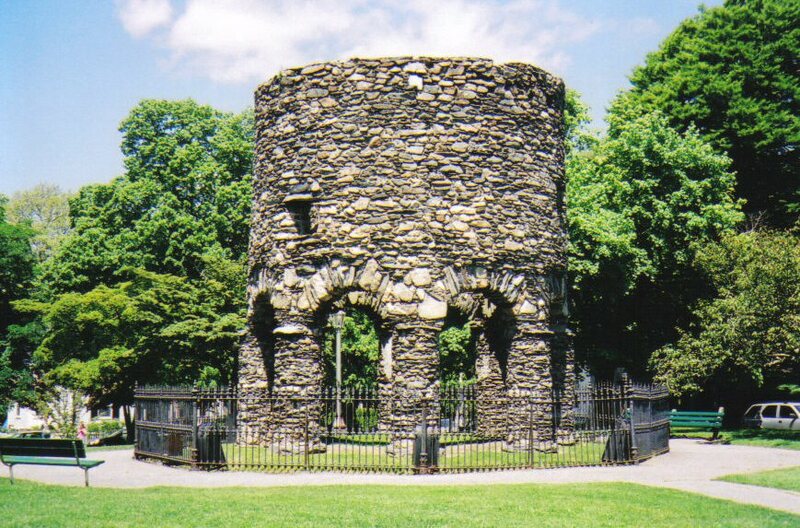 The best Menzies can do is throw in the usual (European) maps that Bad Archaeologists are so fond of, some inscribed stones (without reproducing the inscriptions), the odd mystery building (such as the Newport Tower, a seventeenth-century windmill! ), unidentified shipwrecks and other very poorly documented discoveries. All his claims have been effectively debunked. Perhaps more than anything else, the failure of the Chinese fleet to reach Europe, where it would have been documented by the literate late medieval societies flourishing throughout the continent, should raise eyebrows. So in 2009 he published a new work, 1434: the year a magnificent Chinese fleet sailed to Italy and ignited the Renaissance. The subtitle makes an even more astonishing claim than that of 1421! When does Menzies think that the Renaissance started, for goodness sake? Where is the Italian documentation for the visit of a Chinese fleet? It seems to have been universally panned. What is the appeal of these two books, derided by the majority of serious historians? There is the expert-bashing aspect, for a start. People always like to see them brought down a peg or two and when it is done by an amateur, it makes them feel that perhaps anyone can do it. But there has been a more insidious aspect to the popularity of Gavin Menzies. Because these books are published as a work of history, they degrade serious historical work. The standards of these books, which are at best wishful thinking and at worst outright fabrication, ought to have prevented any publisher from putting them out as non-fiction or, at the very least, to have ensured that they were marketed as works of speculation. Instead, we see them on the shelves of the history sections of any bookshop, crammed between biographies of Stalin and Hitler (although, I’m relieved to say, 1434 is nowhere near as ubiquitous as 1421). The general public does not know and cannot be expected to know that Menzies works are utter rubbish. They look like history books: Menzies follows Graham Hancock’s trick of stuffing the book with footnotes, which most of his readers will never pursue, thinking that he is quoting genuinely relevant evidence. As far as I know, Hancock was the first to do this, as earlier works of Bad Archaeology are frustratingly without adequate bibliographies, often making it impossible to identify the sites or discoveries for which they are making claims. No, Menzies’ works look like ‘proper’ history books, stuffed with boring endnotes that somehow prove their academic standing. There has been a further, more political repercussion to this work. There are nationalists in China who, echoing the old Soviet craze for ascribing every invention useful to humanity as Russian in origin, are seeking to claim all discoveries for their nation. Having pride in one’s achievements is not in itself a bad thing and it is certainly good for us in the west to realise that Europe is not the source of all civilisation and knowledge. However, when it turns into revisionism of the kind that makes outlandish claims without evidence or suppresses contrary evidence, then we are straying into the realms of social evil. Creating generations of people with an entirely wrong notion of their past is the type of wickedness that one usually associates with religions. 9 Responses to Chinese circumnavigation in 1421? Pingback: Admiral Zheng He discovered Australia befor Captain Cook. While your criticism of Menzies may be warranted, isn’t it a bit much to regard his writings as a “social evil” and a “type of wickedness”, highly charged religious terms befitting a zealot? Rather, isn’t it more the case that Menzies is a case of irresponsibility, ignorance, contempt for the rigor necessary to be competent in a research domain, and possibly arrogance? I admit that my terms are a bit hyperbolic. Nevertheless, I stand by my charge that promoting politically motivated and demonstrably wrong views of the past are a “social evil”. It is not Menzies who is irrespoonsible so much as his publishers: surely, they have a duty to check his supposedly factual statements with someone in a position to know. It’s the old process of peer review. Having read 1421 several times with great enjoyment but little knowledge, I resent the blanket denunciations of his evidence. I would be more impressed if his detractors took a detailed look at his evidence and provided alternative explanations for the myriad of items of evidence he provides. It is the accumulation of strong coincidences following the routes of the fleets that add up to a powerful case for the admittedly amazing journeys of Zhu Di’s fleets. But the evidence he uses is ridiculously weak and, at times, it is obvious that he does not understand the evidence. It’s a classic example of someone coming up with an idea and then going out to find evidence to confirm it. That’s not how scholarship works. One starts with the data and then seeks a model to explain it. Gavin Menzies simply went out and collected a mass of disparate date that in no way adds up to what he wants it to. Just follow this link, which, incidentally, is already on the main page, to see why none of the evidence he tries to use actually supports his thesis. I read his book a few years ago and was surprised to discover that, according to Menzies, the Gulf Stream splits at the Azores and then one half goes north to Greenland whilst the other half goes east towards the African coast. This explains why the fleet never got to Europe. Maybe if Zheng had got on the Gulf Stream that reaches Europe he would have got to England. This Menzies guy is a bit of a worm isn’t he? I just spent the last couple of hours (out of boredom) reading of his discoveries of extensive Chinese settlement in New Zealand and am yet to find a single grain of evidence to substantiate his claims. He doesn’t even bother to provide any supporting evidence on his own website; just some photos of very natural looking landscapes with captions outlining what he thinks used to be there. It is a piece of very bad archaeology. I would be interested in investigating some of his proposed sites to probably very easily and quickly disproving his nonsense. Extraordinary claims require extraordinary evidence . I enjoy the notion of your site, but you spoil the effect by indulging your own ill-founded prejudices. First, as an American, let me assure you that changing the titles of books prior to publishing has *nothing* to do with American attitudes, and everything to do with the belief of a tiny handful of people who are usually (look up their explanations for their actions!) far too influenced by European and sometimes Asian-based presumptions about Americans (see “America has no culture,” and “Americans are stupid” to go along with your own “Americans are insular.” Sigh.) I believe those presumptions are themselves the product of only *some* Europeans and Asians…but too many, as in America, deem themselves “intelligent” and above reproach. I trust you can review the anti-American propaganda of the Axis powers prior to WWII? As you do, please compare to current nonsense popular in too many universities, including American ones, where professors are encouraged to follow a disturbing fawning over “Old World” cultures, to the point of blindness to reality. It’s as disturbing as believing in “alien architects,” and considerably more harmful to people. Since the Chinese effort to explore was taught in my nationally-popular junior high school history texts back in the 1970s, I suppose it’s even likely that the change in the title wasn’t due to presumptions of American attitude problems, but rather in anticipation of mockery of the claim of “World” discovery, since a lot of us know darn well the fleet didn’t apparently succeed in it’s mission. That makes it more than possible that the change was meant to hide the more obvious false claim, so as to freely push the notion of a Chinese vessel reaching the western shores of North and/or South America, something which lacks a history of public school discussion and debunking, and which might be expected to appeal to the very real American attitude of seeking to embrace the achievements of “forgotten” individuals and less-European cultures (for better or worse). The “newness” of the “discovery” could be blamed on “Euro-centrism,” a popular worry in America. Secondly, your wisecrack at the end about “wickedness that one usually associates with religions” is extremely disappointing, considering your site’s apparent mission to combat false concepts and “popular” nonsense. If you examine history, you’ll realize that this old saw is just another bit of prejudice; the truth is that teaching false history to generations is usually driven by obsessive control needs, born of philosophy, politics, and individual passions. It may occasionally involve faith – see the insane claims put forward in some modern “Islamic” textbooks (quote marks to highlight the fact that not all followers of Islam believe this weird stuff) or the even more bizarre notions of Scientology – but if you want to talk damage, look at Henry VII of England (personal power consolidation), Stalin and Mao (atheist need to destroy political rivals and philosophical opponents in order to “resculpt” culture), an amazingly long list of philosophers (from Ancient Greece to the modern American NEA), business moguls, military and political sorts, and even would-be do-gooders who simply want to make some “downtrodden” group or other feel better (see Hitler’s favorite historian and source of much of his “elbow-room” argument, or modern American “multi-culturalists” who seek to “help” minority teens feel better by feeding them claptrap falsehoods, instead of doing the work to reveal the very real successes and contributions by members of all races, cultures, and yes, religions). People rewrite history to push agendas, and those agendas are rarely religious in nature, though it has happened. Blaming it on religion, in point of fact, is a fine example of filling a generation with a load of false history to push a bad agenda! Track the source of this “truism” before you continue to believe it. So kindly rein in your anger, and redirect it where it can do more good than harm. Thanks.